Writing a blog post may seem daunting; the kind of task your business may keep putting off. You may think there are better ways to use your time and increase your efforts across digital marketing. Surprisingly, posting a blog can be one of the most important assets to increasing website traffic while introducing new prospects to your products and services for FREE. Yes, I said it FREE. Who doesn’t love FREE traffic? So, how do we do it and how can posting a blog increase your traffic? Let’s dive straight in. Firstly, we need an engaging and share-worthy topic that will have your readers engaged and bursting at the seams to learn more. 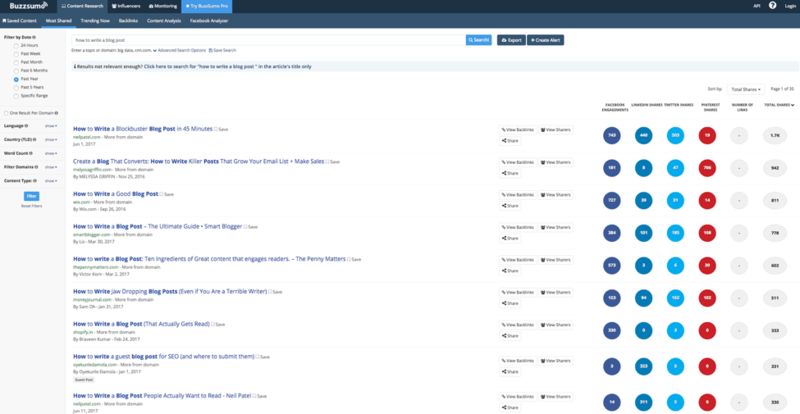 A great resource is BuzzSumo for finding content that is already popular. Simply head on over to www.buzzsumo.com and enter in a topic related to your business or brand. For this example, I have entered: “How to Write a Blog Post”. Next, you will see other articles that have been shared all over the internet. You can also see how many shares, likes, and comments, etc. each post has too. For this example, the top article that pops up is How to write a blockbuster Blog Post in 45 Minutes. Written by New York Times best-selling author Neil Patel, this blog has 1.2k shares overall, across all social platforms. An article with that many shares about blog posts tells me there is some good content in there! We have just found a great article to check out and find some topics and ideas for our own blog post. Open a couple of them to see if there are any things missing we can touch on or anything similar that they are discussing. Now that you have your topic and have done your research, it is time to actually go ahead and start creating your blog post. But don’t just jump in and start writing straight away – like all good things, we need some structure first. Take a minute to try and think of your blog post as three individual parts: an introduction, a body, and a conclusion. Now, write down what you want to include in all of these three sections. Look at that – now you have some kind of summary of your post, you are now ready to write! Headings help to structure the blog post and page, plus they are important for readability and allows the reader to skim through the article efficiently. They also help Google grasp the main topics of a long post which help your organic rankings. You want to include your keywords within these headings so when the search engines do their usual crawl over your site, they can see what you are trying to rank for and reward you accordingly. Pro Tip: Use Google’s Keyword Planner to find relevant keywords to include in your blog post. Choose a keyword that you want to get on the front page of Google for; that will help increase traffic. You can find out how many people are searching for a specific key phrase using the Google Adwords Keyword Planner which will tell you on average how many are searching for that key phrase each month. I would suggest choosing six to twelve keywords you would like to get ranked for and sort them from highest search volume to lowest search volume. You want to include the most searched for terms in your title in some way. For example, when writing this blog post, I used the keyword planner to determine what keywords I wanted Google to rank this post for. The two I found before writing this blog post were: “how to increase website traffic” (1,600 searches per month) and “writing a blog post” (720 searches per month). Combining these keywords together in a compelling title is telling Google not only what my blog post is about but what keywords I want to rank. So, I combined basically both of these key phrases into one in hope to rank for one or both of these keywords at once. Clever trick, isn’t it?! These two search terms can potentially bring in 2,500 new visitors per month. The other four to ten remaining keywords have been used in subheadings and sprinkled throughout the article to have the best chance of Google picking them up. I find writing with your keywords in mind helps a lot because it keeps you on track with your topics. You should also make sure you are linking to other articles on your website, other landing pages, other blog posts, and even other relevant third party websites to back up your claims. This not only helps with SEO but also creates a nice visitor flow through your website. Keep in mind your other articles and landing pages when writing your blog post so you can mention it and insert a link to that page, like our previous blog post about starting writing inspiration, here. Last but not least, is adding some sort of call to action inside of your blog post. It’s okay to give free value and free content, but most of the time people are reading your post or have found your post because they want a solution to a problem or to improve their lives/business. Best practice for blogs is to include a strong call to action. Offer them something they can’t resist. A free ebook, free training, a free phone consultation, something they can get more value out of and move up your ascension ladder from being a cold visitor to becoming a hot customer. Having said that, here is our call to action to you. If you need anything digital marketing related, Chilli is here to help. We have a wide range of services and can help with any of your digital marketing needs. If you need help with a website upgrade, strategic marketing, graphic design, inbound marketing, SEO, website development, Google Adwords, or Social Media Marketing please give us a call. We would love to hear from you! We really hope you enjoyed our article. Get in touch with our team and let us know your thoughts!